When I was told that one of my favorite chefs, Isaac Becker, was opening another restaurant I was anxious to try. And when I discovered that he was dedicating the cuisine to two of my favorites, pizza and steak, I knew I needed to go as soon as I came back to the twin cities. I secured a single reservation on a slow Tuesday evening and drove through normal rush hour traffic to Burch, the newest addition to the growing list of great restaurants in Minneapolis. The parking is difficult and valet for $8 seemed a bit high, but well worth the price. Once you enter the restaurant you see a large dining area directly in front of you that seats 50+ overlooking the open kitchen, a la BLG, and to the right is another large dining area with a bar that seats 20 and table seating for another 50+. The spaces are quite large, yet the use of woods, soft lighting and large windows gives the feel of romantic meets hip, they did a great job on creating a cool, yet intimate dining environment. The menu is typical Becker-eclectic, combinations of flavors that you would never expect; his genius in combining flavors and textures shine with every dish. I am a huge carnivore and the list of grass-fed steaks was amazing. You can choose either 100% grass-fed to grass-fed or grain finished Niman Ranch Natural (Choice of Prime); then various cuts within each category; then you choose a medium or large sized chop. A steak is great but I wanted to taste the combinations of flavors I have grown to love at 112 and BLG. I designed a personal 3-course adventure, starting with the “Lamb meatballs” with carrot slaw, followed by the “Spicy soft shell crab” with lime and yogurt and for my main course I chose the “Coppa Cotta” pizza made with wood roasted red peppers, smoked pork shoulder, mozzarella, and hazelnuts and I added some BLG sausage (I thought it needed a kick). 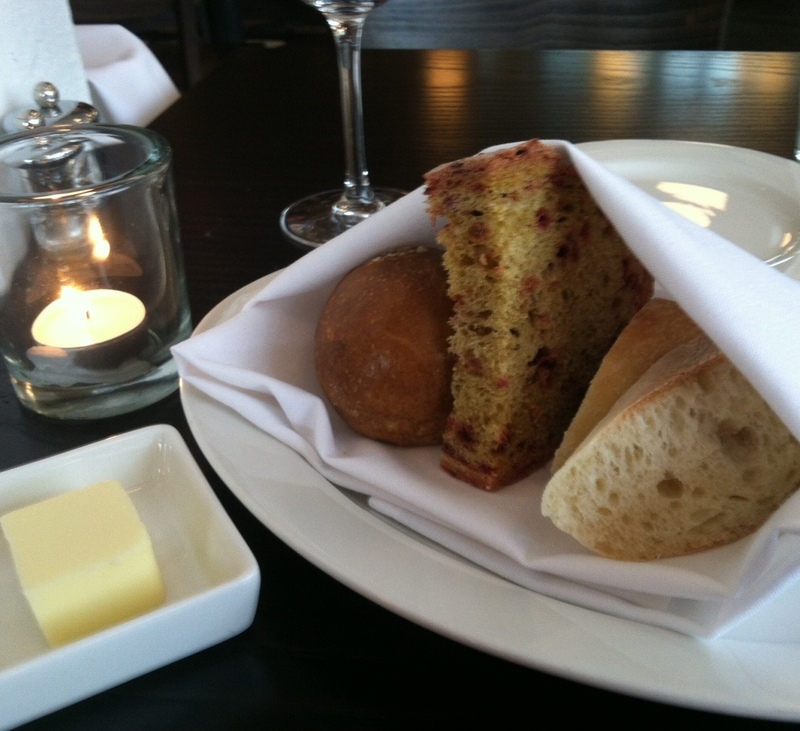 As I waited, the server (who was fantastic) brought a basket of three breads, slices of a baguette, a slice of beet bread and a pretzel roll. They were warmed, which I always appreciate. A bite of each was very disappointing. There was all flavorless, and even the beet bread was boring. The good news was that I would not fill myself on the breads. 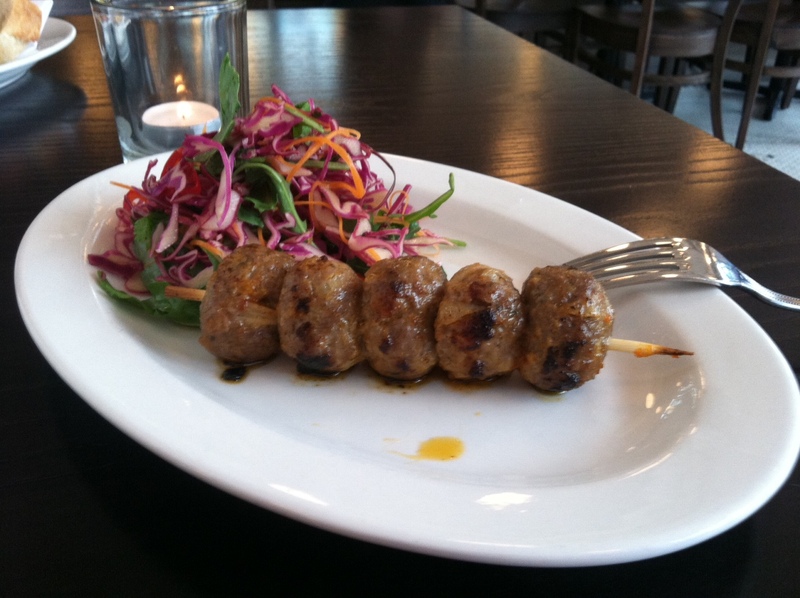 The meatballs arrived, five skewered meatballs, each slightly larger than an inch, plus a mound of slaw. I would not characterize the slaw as carrot slaw, but a delicious and slightly spicy combination of red cabbage, arugula, red pepper and carrot, accented with just a hint of cilantro. The meatballs were seasoned with Middle Eastern spices, with rich earthy spices. The meatballs and the slaw were each delicious on their own and together the spiciness of the slaw perfectly complemented the richness of the lamb; and the addition of the cilantro was delightfully subtle. 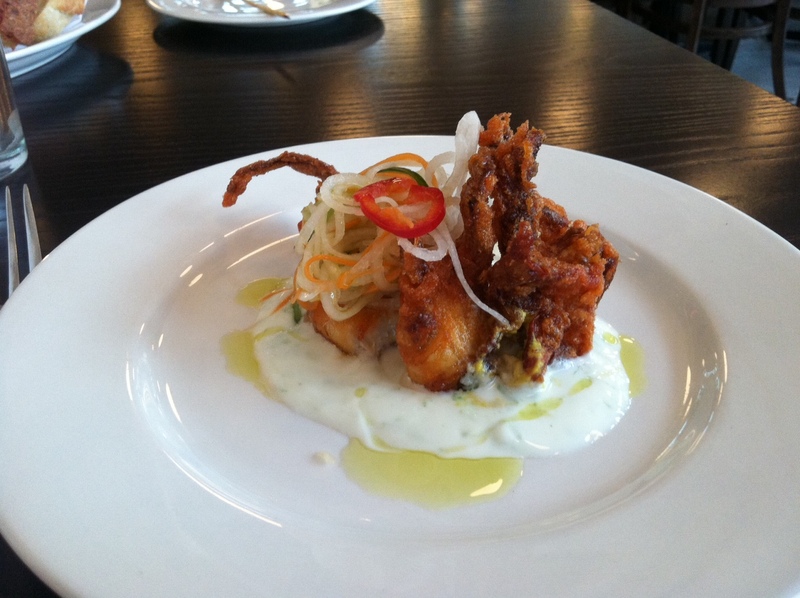 The soft shell crab was a single small- medium-sized crab dusted with a slightly spicy coating and fried. Sitting atop the crab was another mound of a different slaw from the meatball version, this one tinged with a citrusy lime background. The crab was nestled in a yogurt dressing which was further accented by a circle of olive oil. The slice spiciness of the crab, combined with the citrus slaw was a great combination and then both were cooled by the yogurt. Another fantastic dish. The pizza arrived. The first item I noticed was the color of the crust, it was more blonde than I expected and had a few circles of char, indicating the oven was piping hot. I first tasted the crust and it had a great flavor, one of the best I have ever tasted. The kitchen was not shy with the topping and I think they removed the pizza about 30 seconds too soon, since the dough at the center was not crisped enough to handle the topping. I was required to use a knife and fork for the first tastes of the center. The tastes were perfect. 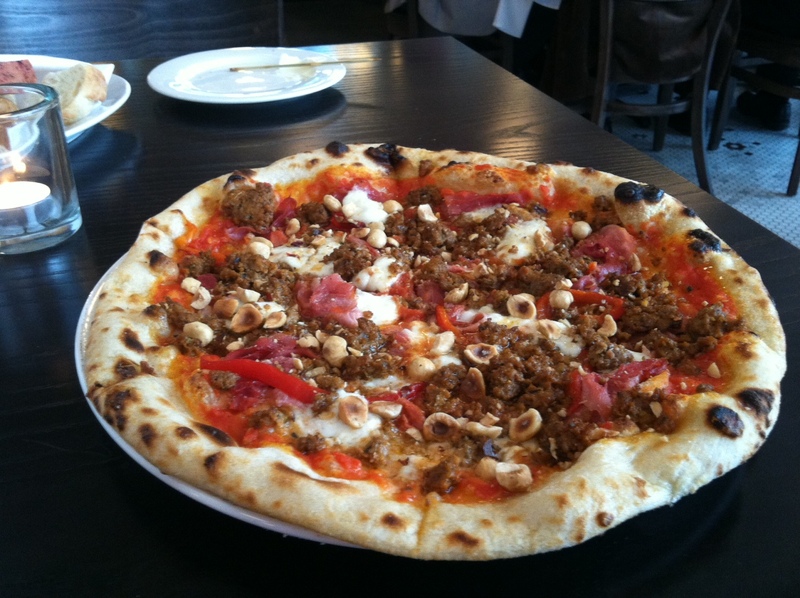 And the key differentiator to the pizza was the addition of the hazelnuts, yes the hazelnuts. How this idea came to be is unknown, but the addition created a level of flavor and texture I have never tasted. In addition the mozzarella cheese, the peppers and the sausage were great. The smoked pork shoulder was sliced in the manner of prosciutto and was the least flavorful of the toppings. Since I added the sausage I wanted to taste the pizza as designed, so I removed the sausage from one of the slices. The taste profile of the “as designed” pizza was more mild in flavor and still delicious. But I think adding the sausage created a much more flavorful choice. I had no room for dessert, but wandered over to the cake display and almost wished I ate one less slice of pizza to leave room for one of these options. They looked fantastic. Overall this is a go-to restaurant only weeks after opening. I only wish Becker would consider expanding his geographic reach and bring these flavors to Connecticut. His food would be incredibly well received. This entry was posted in Minneapolis and tagged Burch, ian Becker, Jeff Schlesinger, jfood by jfoodeats. Bookmark the permalink.